And while we may know that our flaws are magnified in our own eyes, it’s still hard to get over that pimple, or our shy persona, or whatever it may be that we don’t necessarily love about ourselves. Who here has been there? Raise those hands, girlfriends! And don't worry, you aren't alone here. I’m raising my hand high right there with you.. because I still feel this! You see, the flaw I battle with everyday is writing copy for my business while struggling with dyslexia. There are countless times that I have written a blog or social media post, felt super empowered about the message I was delivering, only to be left scrambling to the edit button after it’s gone live because I used the wrong “there” or switched around I’s and E’s in a commonly spelled word. And, the worst part is- when this happens, I often find myself giving negative self talk. I tell myself people might think I’m dumb, or my message wont have the impact I was hoping it would because my fingers typed faster than my brain and I left out a crucial word. - guys that a happens A LOT! But, and this is a totally funny story- I actually got my very first client ever because of a typo on the homepage of my website. And then I BOOKED HER! On my first day in business. In SPITE of that typo. In fact, later on I found out that that typo drew her in to chat with me because she knew it was a real person behind the computer screen. So let this is a testament to you that you don't have to be perfect in business, you just have to be yourself! Because, at the end of the day, your brand is YOU in business form. Each of those things work together to create a brand that stands alone- totally unique from anything else out there. 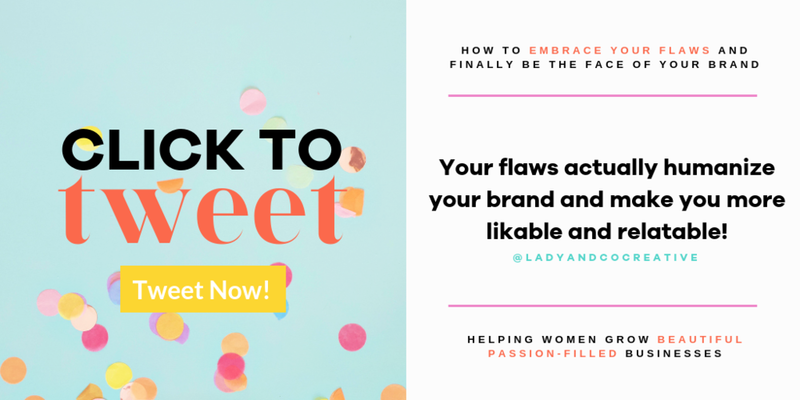 And more than anything else, your flaws actually humanize your brand and make you more likable and relatable! Well, embracing (and even showcasing your flaws) not only builds trust by making your brand more human, but it also differentiates you from your competition. Your flaws become your brands superpowers! Be as specific as possible! Don't say "I don't like the way I look" and instead zero in on that you don't like how your skin breaks out, etc.. Instead of calling them flaws, call them “quirks” or “habits”. I personally like to call them perfect flaws! Instead of saying “I’m shy” say “I like to get to know people before opening up” - This is gentler self-talk and will help you with your perception of yourself. Find another way to speak about your so-called flaw! Stubbornness can also be seen as determination, and being overly emotional usually means you’re empathetic and can offer comfort to those that need it. Start to talk about your quirks in social media posts and speak freely of them to your clients to normalize them! In fact, when working with clients, I now start my 1 on 1 coaching calls by explaining that I have dyslexia and that if they see a typo in my notes, to call it out and it wont hurt my feelings. Then we usually have a good laugh about a few out there misspellings! Try to remember that your “flaws” can actually be your biggest superpower! 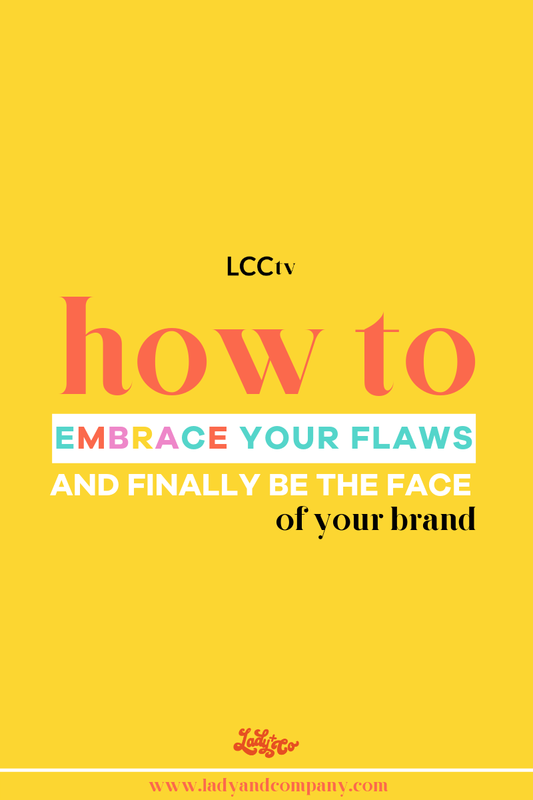 And by embracing your flaws you are opening the doors to: 1) Being set you apart from your competition, 2) Humanizing your brand and cultivating likability, 3) and drawing in more like-minded customers and clients that will get you! Oh, and subscribe to LCCtv channel on YouTube! I'm the branding coach and the lady behind Lady and Company Creative. I adore helping other female entrepreneurs kill it with their business by creating badass brands that showcase their passions. I create websites that work and brand strategies that will put your business on the track to success. I know that each of us holds innate qualities that make us the amazing humans we are. And, I believe we are meant to use those talents to better the world around us. Who we are is purposeful and our calling is built directly within us- sometimes we just have to uncover it. That is exactly what I help you do. Want access to even more content just like this? 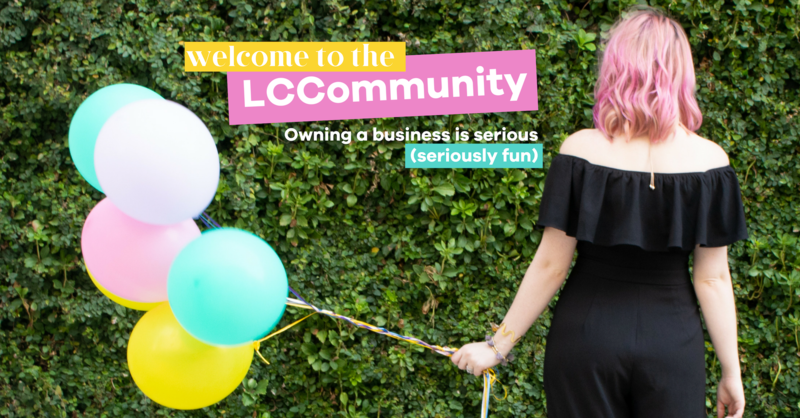 Join the FREE LCCommunity on Facebook right now!